View Poll Results: Do you use Heartgard Plus or Interceptor? I am so very lucky in that not one of my girls ever has had fleas and I have had Dobes for 20 yrs. I guess its my yard or something. I have never treated the backyard with any chemicals or fertilizer as I am worried to death about any complications on their paws and getting into their skin. We have a good lawn and there is what I refer to as the dog patrol area that goes around the perimeter of the privacy fence. I use Heartguard only. I've used Interceptor for awhile without any problems. I'd used Zodiac in the past for flea & ticks without any issues and it seemed to be very effective (used to live in a heavily wooded area). However, I haven't been using any flea/tick protection the past couple of years because so many people advise against the topical chemicals (I also don't live in a wooded area anymore). So far, I haven't had any ticks or fleas on my guys. Last edited by lyngr; 07-17-2008 at 01:59 PM. Dogs Name: Wittrock's Jozzzzzelle, "Jozzzzzy", Von Luka's Rainmaker "Raven"
Just found this thread, and am interested in any other feedback from vets/vet techs/vet pharmaceutical experts on DT re the use of Heartguard vs Interceptor, in addition to what has been posted here. Roman was on heartguard and contracted a mild case of heartworm. The vet can tell how progressive the heartworm is by the color of the test module. He was treated for the heartworm, got his negative test, has been on Interceptor since. Heartworm, "all" worm negative since. (2 years). Our vet says that it has happened before in some dogs taking Heartguard, but he had personally never had the experience of any of his patients taking Interceptor, contracting heartworms, or any other kinds of worm. Interceptor also gets into the dogs bloodstream faster, and is absorbed by more relevant tissue. We used Interceptor for most of the years with Scout, then our vet switched to Heartguard Plus. Scout always tested negative (annual) for HW. Foster (rescue) tested neg for HW when we came to us (but had tapeworms); he currently receives Heartguard Plus. Interesting note that on our Heartguard Plus box, the clinic rx label says "for the prevention of heartworms, roundworms, hookworms, whipworms"!? Just a side note. Our Merial rep said that Heartgard plus does get whipworms but they can't go back and get the label for it because the beef chew would no longer be approved. Whipworms aren't a big problem around here, so not sure what to believe. Kahlua - did the Merial rep explain further WHY the beef chew would no longer be approved with a label re: whipworm? So far, it looks like the poll is 50-50. Trying to decide whether to switch [back] to Interceptor from Heartguard Plus. Will also be asking for our vet's most current opinion. BTW - thanks for this thread/poll, Burns! Last edited by LizM; 07-25-2008 at 04:53 PM. No chemicals on lawn, only organic teas etc to feed flower garden, no plants that aren't safe for dogs to eat. We have a Shi-Tzu too and haven't seen a flea in our house in 8 years! We use Wormshield. It's made by Hannah Pharmaceuticals for Schuyler, LLC in nearby Vancouver WA. Each chewable tablet contains 272 mcg ivermectin and 237 mg pyrentel as pamoate salt. We are prescribed the tab for large dogs 51 - 100 lbs. Yes, regulations have changed to where a beef chewable would no longer be approved/allowed. They would have to go to a tablet form which would loose them their unique chew, even though they could gain the whipworm label. They decided the expense, reformulation, and potential loss of market wouldn't be worth it. We used Interceptor for most of the years with Scout, then our vet switched to Heartguard Plus. Was there a reason the vet switched you from Interceptor to Heartgard? I was wondering which of these two products you prefer and why. Basically, I am trying to decide if it's better to cover for more genus species of hookworms and no whipworms (Heartgard), or to have less hookworm coverage but covers whipworms (Interceptor). I just use Ivermectin I purchase from the feed store, I give them 1/10 CC per 10 lb of bodyweight orally, It is the active ingredient in all heartworm preventatives. "Show me your dog and I will tell you what manner of man you are." We Use Heartguardplus and Frontline. I was using sentinel ,but I found A TICK on Charlie and that was the END OF THAT! I have had no Fleas, Ticks or worms with Heartguard and frontline! 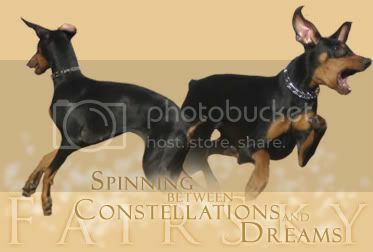 Location: Gone to the Dobermann kingdom! I do know it is recommended by most vets that I know for the prevention of heartworms. Our vet started Axel on Heartguard .. but I'm wondering if I want to switch to Interceptor is there any down time, so to speak, that Axel would need to be off of one before starting the other? We have used Ivermectin we buy at the feed store for many many years. The first dosage we used (figured by a vet) was 1/10th cc per 22 lbs. Quite a few years ago our vet asked us what we were using and how much. He told us it had been refigured (don't know by who) and we didn't need to give that much. So for 6 years or so we have been giving 1/10th cc per 40 lbs. I had always used heartguard, for years and years. It was what my main Vet used to prescribe. I never had a problem with HW or anything else. However Miesha had a vet appt. today with my main vet (she's the best!!!!!!!) and apparently Miesha has whipworms YAY!! But she doesnt use heartguard anymore anyway. So Interceptor it is! Never had any issues with fleas and have only used Heartguard for 20+ yrs. For what it is worth, Sweep had high liver enzymes and ALL vaccinations and treatments were stopped until we could get a handle on the situation. First thing she was put back on was heartworm meds and the internist INSISTED that it be Interceptor rather an Heartgard because she said it is easier on the liver. I am not to use any flea or tick topics at all. Interceptor is a much better product. Here's what I read recently in the instructions for Heartgard Plus that may be a big factor in dogs on heartgard Plus that got Heartworms. The instructions(in small print) say if your dog tends not to chew food, they suggest tearing the heartgard in pieces and feed it this way. Interesting! All my Dobe's inhale their food. So, I rip heartgard in small pieces and never had heartworm issues. What this tells me is, whole doses of Heartgard Plus does not "disolve" well in the dogs digestive system. So, by breaking it up, helps the digestion of Heartgard. I think this is the key and why some Vets are steering people towards other products. I don't know, but Heartgard Plus is certainly a lot less expensive. Just follow the instructions and you should be okay! If someone would do research on Dobes and their health, skin, coat, immune problems for the last 10 years, I bet you would find less problems in the dogs that are limited as to what they are given or put on them compared to the dogs before that 10 yrs....just wondering????!! 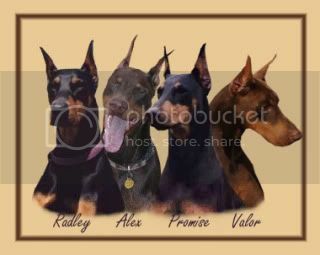 I had one doberman die from liver disease caused by Heartguard II. Gretchen, my 13 year old had a horrible reaction both from it and Intercepter so she has not been on anything for the last 10 years. Wolfgang got an allergic reaction everytime we would either put heartworm medicine on him or in him, so he probably won't take anything anymore. My vet talked me into the 6 month shot for my Ibizan Phoebe when she was very young and the very next day they pulled it from the market. Those were the longest 6 months I've ever lived. She's had all kinds of weird problems ever since and I still wonder if it didn't come from the shot. I vax every 3 years instead of every year. We don't get mumps/measles/polio shots every year so why should dogs be constansly innundated with foreign immuno-agents?